Leading chemical protective clothing manufacturer Alpha Solway has launched a new range of lightweight, flexible and chemical resistant clothing – Chemsol HG Lite™. 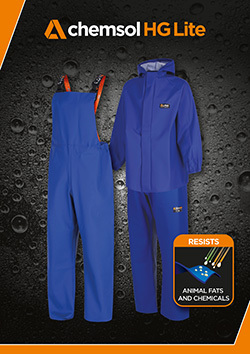 Following an extensive research and development project with end user companies across a range of industry sectors, in particular food and drink manufacturing, industrial cleaning, oil and gas and agriculture, the new range – featuring jacket, trouser and bib and brace - has been developed specifically for factory wash down applications. Manufactured from a specially formulated material with an enhanced anti-bacterial coating to avoid mould build up, the new range offers long-lasting chemical protection and resistance to chemicals, animal fats, greases and food oils. “Chemical exposure is a major risk to workers in the UK according to the Health and Safety Executive (HSE) and the launch of the new Chemsol HG Lite range offers a really effective solution to this. “Often, workers that carry out wash down activities are only provided with waterproof protective clothing or clothing that does not provide any chemical resistance. By developing and launching Chemsol HG Lite we have been able to combine comfort, impermeability and protection from chemicals and animal fats in one solution,” said Nick Moore, Product Development Director of Alpha Solway. “As with all of our re-usable chemical protective clothing, the new Chemsol HG Lite range is designed and manufactured in our UK factory to the latest EN standards in accordance with the BS EN ISO 9001 quality standard,” added Nick Moore. Available in standard small, medium, large and extra large sizes, there are also options to have the range in wider size ranges such as XS and XXXL.